How and where is my therapy done? You have taken the right decision of getting treatment done at Advancells and so you will be intimated about the time and date, on which you have to meet our representative. Our representative will take you to the specialist at the hospital for a detailed consultation after which you might undergo radiology and/or pathology tests if required. Once the test results are back, the specialist will discuss your treatment modalities in detail. You are encouraged to ask as many questions as you want to; feel completely confident not just about the treatment but also about the doctor and the hospital. All the treatments will be done under the medical surveillance of the most outstanding healthcare specialists such as neurologists, neurosurgeons, cardiologists, anaesthetists, orthopaedic surgeon, radiologists and paediatricians. The hospitals are of top most standards and a dedicated team of highly trained physicians, patient advisors and nurses look after the patients. In addition, we provide other facilities for our Outstation patients like travel assistance, hotel booking, transportation, visa assistance etc. Positive serology for other infectious diseases. Stem cell therapy is performed in agreement with the principles of “Good Manufacturing Practice” along with the most advanced technologies and the best medical standards that are available. The risks associated with the adult stem cell therapy are almost negligible. The therapy includes the use of patient’s own cells so the risk of rejection simply does not exist, which might be possible in case if a donor is used. Depending upon the assessment the source of stem cells will be decided. It can either be bone marrow or adipose tissue. In some specific cases, we can provide stem cells obtained from both the sources but the decision will solely be taken by the treating doctor. One of our senior Neurosurgeon/Orthopaedic surgeons will extract the bone marrow from the iliac crest (Hip Joint). Normally, the procedure takes around 30-45 minutes. Local anaesthesia is first administered on the area of the skin that is to be punctured. A bone marrow extraction needle is then used to extract about 100-120 ml of bone marrow. Option of general anaesthesia is available for patients who need it. Once the extraction is done, the sample will be immediately transferred to our clean room facility for processing. 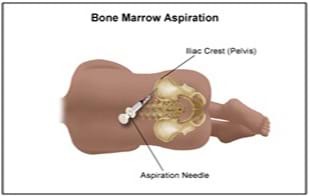 More detailed information on the bone marrow collection procedure is available in the Bone Marrow Informed Consent document (PDF file). In a clean room, stem cells will be separated from other unwanted mature blood cells and plasma. The processing of samples will be done as per cGMP standards under sterile conditions. Utmost care will be taken to make sure that stem cells do not get contaminated by any kind of infections. Post processing all samples will be tested for quality and quantity of stem cells. 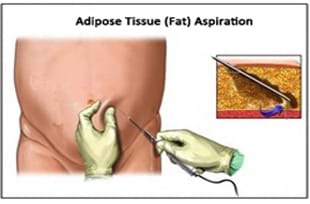 One of our operating surgeon/cosmetic surgeons will extract an adipose tissue from an area of the body, which is generally pre-umbilical area; where sufficient amount of fat is available. Once the location is confirmed, a patient will be asked to lie in a supine position. He will be given a local anaesthesia. A 60 CC cannula is inserted under subcutaneous layer and approximately 100 CC adipose tissue is collected. Once the aspiration is complete, the sample will be immediately transferred to the clean room for further processing. Fat is abundant source of progenitor/stem cells; which will be separated from other mature cells such as macrophages, adipocytes etc. in our clean room facility. The processing of sample is done as per approved cGMP standards under sterile conditions. Utmost care is taken to make sure that stem cells do not get contaminated by any kind of infections. Post processing, all samples will be tested for quantity as well as quality. 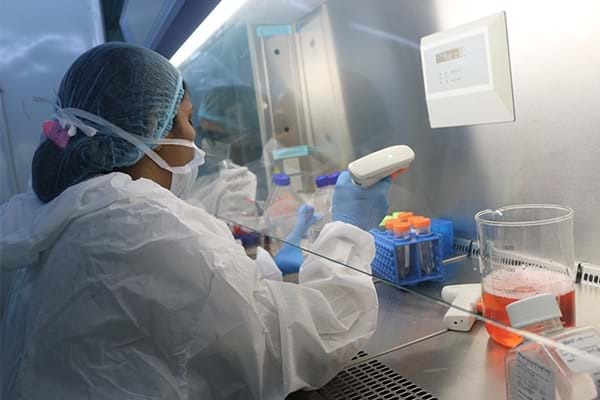 We provide each client a Third-Party Certificate (from an internationally accredited lab) for the cell count and viability of the cells that we process from the autologous cell source of the patient. Intrathecal administration is the infusion of stem cells via injection into the spinal canal, most popularly known as lumbar puncture. Intravenous administration imageBy using this route of administration, blood brain barriers are avoided ensuring maximum deliver of cells into the cerebrospinal fluid. This route is particularly efficient in neurological disorders. For the infusion of cells, puncture is made in the lumbar region; which is the lowest vertebrate at the back from where some spinal fluid is extracted. The administrator will ensure that the volume of the spinal fluid extracted will be equivalent to the amount of stem cells infused. This will ensure that there is very little pressure difference in the spinal fluid space. Any change in pressure of the fluids in the spinal cord may cause a little headache and dizziness in the patient. This symptom is not very hazardous and it lasts only for 1 or 2 days. However, many a times this pain can be uncomfortable especially while getting up from a horizontal position due to the change in the pressure ratios. 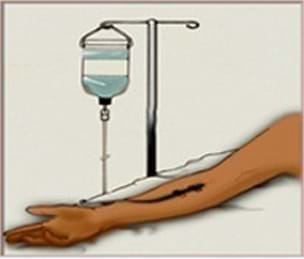 Intra muscular injection is infusion of stem cells directly into the muscles. It is used in particular when small amount of cells are to be administered. The procedure is through injection ensuring release of pool of stem cells directly to the affected area. Target area with ailing tissues can include knee, shoulders, hips etc. Hence the ideal site for administering the injection are Thighs, Top of upper arm, Knee, Hips. Once the targeted muscular injection of Mesenchymal Stem Cells are given, they reach the diseased area and start the process of rejuvenation and repair. Thus the therapeutic efficacy of transplantation of Stem Cells through targeted muscular injection has been found to highly effective. Also results have indicated that when intramuscular injections are given along with a combination of more than one protocol the process is much more beneficial in promoting regeneration and functional recovery of nerves and joints. 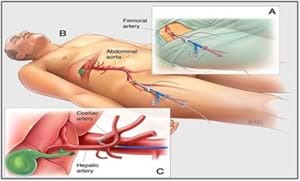 Intra arterial infusion is generally an insertion of cells through a thin catheter inserted into the artery. The infusion is generally done with intense care to avoid damage. Through X ray imaging a catheter is directed towards the targeted area to ensure maximum cell delivery at the site of damage. This route is generally preferred for vascular organs such as kidney, heart or pancreas. The intravitreal drug delivery has become the most reformed technology in treating some of the ophthalmic conditions such as macular oedema, retinal vein occlusions, etc. These are the conditions wherein single dose administered through intravitreal region is more effective than repeated injections through retrobulbar mode. The inside of the human eye is filled with a jelly like fluid known as “Vitreous”; an intravitreal injection is the direct shot of stem cells into the vitreous structure near the retina at the back of the eye. The entire procedure takes no more than 15-20 minutes. The procedure requires dilation of the pupil, which can be acquired by placing specific eye drops in the eyes. Once pupils are dilated, the patient will be allowed to lie in a comfortable position and anaesthetic drops will be placed at the interior surface of the eye. After cleaning both the eyes and the eyelids through the iodine antiseptic solution, with the help of a small device the eye and the eyelids are kept open during the entire procedure. 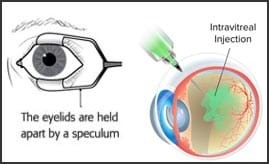 A shot of stem cells will be injected directly into the vitreous region with the help of small needle; a patient may feel slight pressure on the eye without any pain. The eyes will be checked properly, some antibiotic ointment can be placed in the eyes if required. 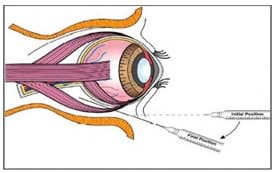 The retrobulbar injection is a very common method routinely exercised by many ophthalmologists for the infusion of stem cells to treat diseased eye such as Macular Degeneration, Glaucoma and other eye disorders. In this particular procedure with the local anaesthesia needle will be inserted inferior to the maximum diameter of the globe and perpendicular to your face. Once past the axis; the needle will be angled medially and superiorly. Final needle position will be within the muscle cone. Concentrated number of stem cells will be injected in the area near macula under the eye. This method of administration is preferred because of the higher number of cells directly into the targeted area to maximise the output. Advancells can also give a combination of two protocols depending what the doctor feels is right for the patient. Liberation Angioplasty is a very critical process. X-ray scanning is used to guide the catheter with the balloon tip to the affected area or veins. Once it reaches the targeted area, the tip expands resulting in the widening of the stenotic area. The entire process takes around 90 minutes. Then the patients are kept in recovery room for around 4 hours to ensure that there is no bleeding from the catheter insertion tract. 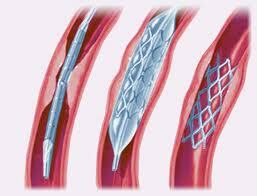 After the first step of liberation angioplasty the blood flows with ease through the stenotic veins. This is essential in order to determine the effective potential of the stem cells introduced to transform into specialized cells necessary for regeneration or repair of damaged tissue of the brain or the spinal cord. This procedure can also reduce the inflammation throughout the body. Many of the patients have reported that the recovery is extremely fast after this treatment. Intra-Dermal Administration around the wounds: – This particular technique is used in case of open sores such as diabetic foot or pressure ulcers. It involves infusion of stem cells directly into or around the wound area, i.e. the injection into the dermal layer of the skin. This layer is the most preferred layer underneath the epidermal layer of the skin, as it is highly vascularized layer, containing dense blood vessels, immune cells and dermal dendritic cells. This way infused stem cells will promptly elicit and strengthen body’s natural healing signals for faster recovery. Intra-Dermal Administration around the hair follicles: – Platelet Rich Plasma is mixed with the patient’s own adipose tissue stem cells extract at the time of infusion. The scalp is numbed with the application of local anaesthesia and the PRP along with the stem cells is infused around the follicles with the help of small micro needles. This intra-dermal, local application of PRP with stem cells can accelerate the healing process around the follicles immediately. The approach can stimulate the native stem cells and provide the strength, support, vitality and resilience to the follicles; which will be helpful in generating new hair strands naturally. 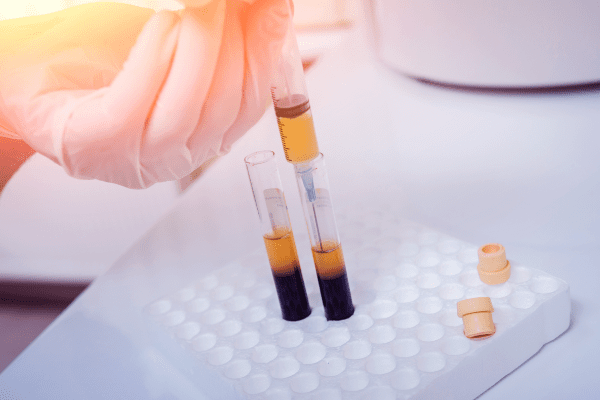 Intra-Dermal Administration of PRP on face: – Platelet Rich Plasma is mixed with the patient’s own adipose tissue stem cells extract at the time of infusion. The face is numbed with the application of local numbing cream and the PRP along with the stem cells is infused at different points on the face such as around the eyes, lips, chin, etc. with the help of small micro needles. This intra-dermal, local application of PRP with stem cells can accelerate the healing process around immediately. The approach can stimulate the native cells for the increased production of collagen, removal of photodamaged cells, pigmentations and wrinkles to give you fresh, tightened, wrinkle free skin naturally. In general, most of the intradermal injection are delievered inside the skin, through micro needle via mantoux technique; wherein the needle will be inserted at an angle of 5-15 degree around the area. Through the advanced development in the field of Tissue Engineering, the regeneration of damaged tissue is possible by allowing rapid cellular integration into highly porous biocompatible material; acting as the most suitable microenvironment, through guided tissue regeneration. These scaffolds essentially act as templates for tissue regeneration through stem cells integration. 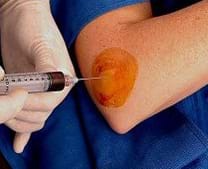 The scaffolds made up of three dimensional porous structures are typically implanted with stem cells and shots of growth factors, through platelet rich plasma. 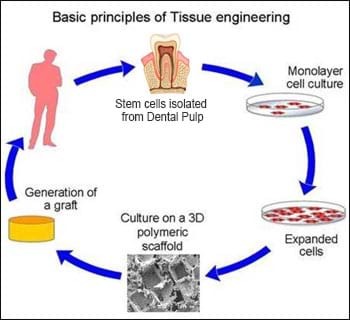 Thus, regeneration of tissue is allowed systematically; through combination of stem cells, signaling pathways and biodegradable material, as our tissue engineering triad. Autografts or Autogenous Bone Grafts are made up from patient’s own bone, obtained from some other part of the body. Typically, an autograft is being harvested from the chin, jaw, lower leg bone, hip and the skull. These grafts are advantageous, as it contains living cellular elements that enhance bone growth. However, one of the major drawbacks of autografts is that it requires second procedure for bone harvestment; which is not quite convincing. Allogenic Bone, or allografts is basically a dead bone harvested from a cadaver. This bone graft is further processed to withdraw water. This, can act as a good scaffold for cultural development of multipotent stem cells. Xenogenic bone grafts is derived from living bone of other species, such as cow, pig, etc. This type of bone is processed at a very high temperature to avoid the potential immune rejection as well as the issue of contamination. Same as like allogenic grafts, xenogenic grafts also can be utilized for providing functional as well as structural support. The brain surgery requires a lot of modern technical equipments and tools in order to operate and infiltrate the skull the procedure is called as Craniotomy and infuse the stem cells in the brain. The highly valued advanced brain navigation system is used in order to reduce any kind of damage to the brain tissues during surgery. General anaesthesia is a must in this process. This surgery is generally completed in an hour and there is a written protocol of the procedure. After the surgery, the patients are kept for a night in the care unit for observation and thereafter transferred to the normal ward. After two or three days, they are released. Spinal surgeries are also very critical in nature and require ultramodern equipments and machineries. The prime usage of the tools in this surgery is for laminectomy or the opening of the vertebrae. Thereafter another incision is done on the spinal fluid embedded dura-mater of the spinal cord. After injecting the stem cells using a very fine needle the openings are closed or sealed. This particular surgery is very complex and its duration is almost three hours. General anaesthesia is used in this surgery. The proceedings of post operation are almost similar to that of the brain surgery and the patient is released after two or three days. Patients can leave the hospital after few hours of stem cell transplantation although in certain cases especially when cells are transplanted Intra-arterial via catheter or surgeries; a patient is advised to stay for a longer duration. A 24-hour hotline is available for the patients to clear up any doubts and queries that they may face right after their discharge. Our doctors and patient consultants are always available over phone and emails. A patient can easily be in touch with his or her physician, which in return helps us to study their recovery. Before undergoing this process; a patient must understand that stem cell therapy is an experimental therapy that may fail to work at certain times. A patient might be refused treatment or the proposed protocol might change depending on the patient’s health condition at the time of procedure. At Advancells, our primary motive is to offer the best technology available; safety of which has been proven across the world.